For women in the 18th century, even wealth and talent offered little escape from proscribed gender roles. The film MOZART'S SISTER (Nannerl, la sœur de Mozart) puts forth the notion that Nannerl (Marie Féret), the older sister of Wolfgang Amadeus Mozart (David Moreau), may well have been just as talented a musician and composer as her sibling. Her father Leopold (Marc Barbé) is surely aware of this fact, and for a time he's just as willing to exploit her talents as he is those of her brother. However, Leopold takes great pains to keep Nannerl from playing the violin (the harpsichord is considered far more suitable for a young lady), and refuses to teach her how to compose music. She may not know how to write it down properly, but the music is there in Nannerl's head nonetheless. The film follows the family, which also includes Leopold's wife and mother of the children Anna Maria (Delphine Chuillot), as they travel and perform throughout Europe. Along the way they meet 3 daughters of the King of France who have been sent to live in a Convent, never to be seen by their parents again. Nannerl strikes up a friendship with Louise de France (Lisa Féret) who, had she been born male, would be the heir to the throne. It is through Louise that Nannerl gains entree to the Dauphin himself (Clovis Fouin). The young is prince enamored of Nannerl's musical abilities, and perhaps more than that. 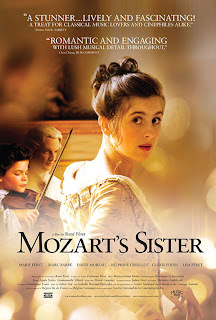 I have my doubts as to the historical accuracy of much of the film's plot, but that doesn't stop MOZART'S SISTER from being a good film and getting across its major theme on the repression of women. Obviously things have improved considerably in the realm of gender equality over the passing of centuries, but even today there are those who will try to tell young girls (and boys, for that matter) that something they feel passionately about and have a gift for isn't for them simply because they were born with the "wrong" set of reproductive organs. This film makes clear just how sad that really is. The period costumes and set design are convincing but not overly sumptuous, and the performances are much more subdued and realistic than the sort of Shakespearean affectations one often finds in historical dramas. This is a low key, leisurely film, and while perhaps a bit cold and distant at times, it is not to my mind boring. Of course there are those for whom a two hour period piece is going to be a snoozefest no matter how good it is, and I assume you know if that's you or not, but for those open to such things MOZART'S SISTER is quite good. 3 out of 4 stars.